I was sent a package of Purex® Crystals Dryer Sheets to review. When I opened the box, a fresh floral scent flooded the room. I was surprised that the scent lingered in the kitchen for such a long time after I moved the box to the laundry room. These fabric sheets would smell great tucked into a clothes hamper, dresser drawer, or even in the middle of a toilet paper roll! They come in two scents-- Fresh Spring Waters and Lavender Blossom. After washing a load of laundry, I threw the clothes in the dryer with one of these fabric softener sheets. I love that they reduce static cling, repel pet hair/lint, and smell good. If I could change one thing about these dryer sheets, it would be for them to leave the clothes with a stronger smell. One of the main reasons I use dryer sheets is to add that extra scent to my laundry. I was surprised the scent was faint on my clothes, since the sheets are so pungent straight out of the box. Next time I'll be sure to add a second sheet in there! To celebrate the release of the New Purex® Crystals Dryer Sheets, the Purex® brand is hosting a Sweepstakes. One grand prize winner will receive $500 and a year’s supply of Purex® Crystals Dryer Sheets, while 50 2nd place winners will receive a coupon for free Purex® Crystals Dryer Sheets! CLICK HERE to enter!! Ends May 9th, 2014 at 3pm PT. 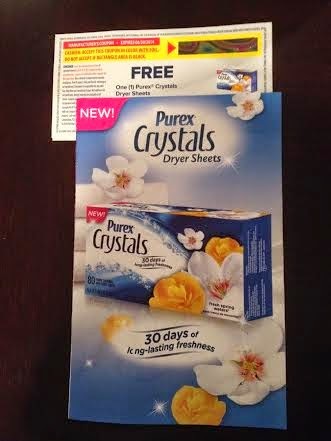 "The Purex® brand provided me with a sample of Purex® Crystals Dryer Sheets in exchange for a product review. However, all the opinions expressed here are my own." We use the entire Purex line of products, including the liquid detergent, dryer sheets and crystals. We have never tried the crystal infused dryer sheets. I like the Purex crystals, so I'd love to try this too. I'd love to try these - anything to make my towels smell good again. I like all of Purex products so I know I would like these also. I like purex crystals...so I'd love to try the dryer sheets. i love the purex crystals! great giveaway! I would like to try the product before buying it. I love other Purex products, and haven't tried these yet. I would love to since we use dryer sheets often. I enjoy trying new things, especially nicely scented products. I like Purex products, and the dryer sheets I'm using now just don't seem to do the job. I want to try them because Purex makes great products. I like the other Purex products so I would like to try these. I'd love to try since I love purex. I'm an avid fan of Purex - would love to try Purex' new dryer sheets. I love all Purex products. 30 days of freshness. I would love to try them on my sheets. With the hot, humid summer coming I want to have a dryer sheet that gives our clothes a nice scent. I love purex detergents so looking forward to trying these! because I love trying new products and I love purex! I have been searching for a long lasting good scent for my laundry. This might be it! One reason is that I love Purex products and use the crystlas and the liquid detergent. We love Purex and I bet it smells great. I want to try these dryer sheets because I am a Purex user and haven't been disappointed with any product I've tried by Purex. I would like to try them because my son plays lots of sports and I am always looking for a better way to get his clothes smelling fresh and clean! I want to win these dryer sheets because dryer sheets are great at getting amimal hair off of clothes. I have 3 cats and 2 dogs and sometimes our clothes have more animal hair on them than the animals have on themselves. Ive heard great things and have 3 young daughters that get their clothes very messy! We love Purex products and would love to try these new dryer sheets! I love trying all of Purex's new products. You can count on quality and effictiveness with every one! I love Purex and have tried all of their new products as they come out. I have not tried these yet and would love to. I want to try this brand because it states that it repels pet hair. My cat tends to shed quite a bit and I would love to not have to worry as much about pet hair on my dark clothing. I want to try this because I always like Purex products and I bet these smell really nice. I'd like to try the dryer sheets because I like their detergent. I like all the other purex products and would love to try the dryer sheets. I would like to see if the product will soften my clothes. I like how Purex soap smells, would like to try the dryer sheets. My family love the way purex makes our laundry smell and feel and we would like to see if these dryer sheets enhance those feelings! I want to try it to see if it will help our laundry smell better! I have recently switched to purex detergent so I want to win so I can see if I like these as well. I want to try these because I love Purex products, thanks! I want to try them so I can see if I love them as much as the rest of the Purex products! I would like to see how they compare to what I currently use. I use purex products and love them. I would love to try the dryer sheets. I have never used Purex Crystals, but I would love to try them out! Thank you so much I just found out I won one of the coupons and everything helps! Thanks Purex!